This US Automatic gate operator is not compatible with EMX IRB-RET Photo Eyes. The U.S. Automatic Sentry 300 series single swing gate opener is the most reliable and durable gate opener available backed by a Limited 3 year electrical / 3 year mechanical warranty. 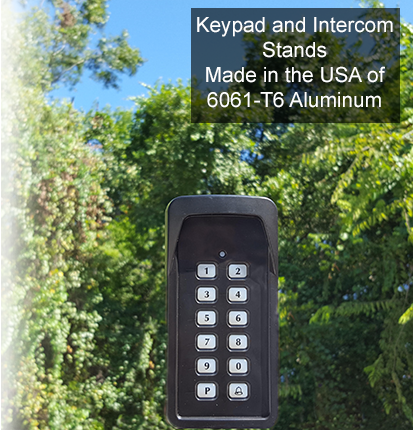 Made in the USA, this gate opener features Plug N Go wire connections, pre installed components, and universal mounting brackets. 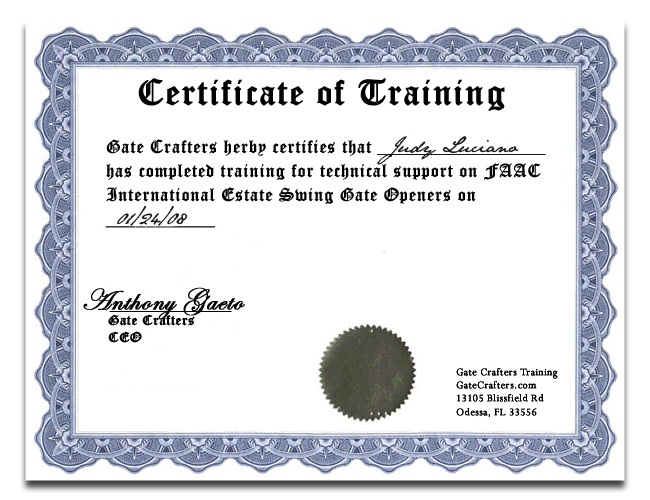 Gate Post or Column size (pull to open ): The pre-drilled hole on actuator bracket must be located 5" behind the gate hinge and 8" to the inside of the property. Push to Open : Yes. The pre-drilled hole on actuator bracket must be located 7" in front of the gate hinge and 4" to the drive side of the hinge. Power Wire Specification: Transformer is supplied with 12 feet of cable, if extension is needed use Sentry Charge Cable Extension Kit (part #630050). 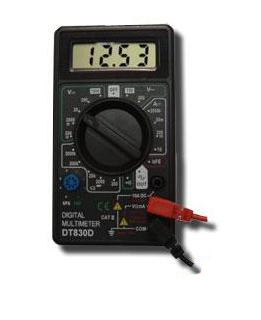 Warranty:3-year control board/ 3-year component warranty. The Plug N Go design of all installed components and the easy to understand Sentry control board makes this the simplest gate opener for the Do-It-Yourself installer. Typical installation time is under one hour. 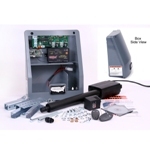 The Sentry 300 automatic gate opener is powered by a 12-Volt dc battery (not included). This battery is charged by the supplied transformer which requires AC power (120 VAC) to be either at the gates area or within 1000 feet of the gates area. If the AC power is more than 10 feet from the gate openers control box then additional extension cable is required. The automatic gate openers solar charge method is optional and requires the Sentry solar panel kit (sold separately) for proper operation. Typically only one panel will be required. The Sentry single swing gate opener is capable of a high number of cycles per day. For information on what you can expect from a solar charged system see the solar charging section of this site. 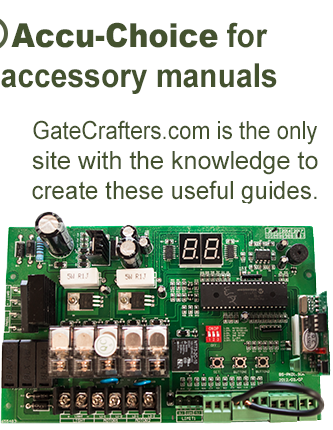 Accessories that are added to your gate opener must be solar friendly accessories and they will be identified as such. Review the solar region map to determine the number of cycles per day you can expect from a solar charged system. The Sentry 300 control board features high quality components and industry leading ideas such as auto resetting fuses for motor protection. The old auto type fuse that blows and must be replaced has been designed out of this controller to avoid the unnecessary expense of buying fuses. Another patent pending item designed into the control board is the on board potentiometers for adjusting stop limits. 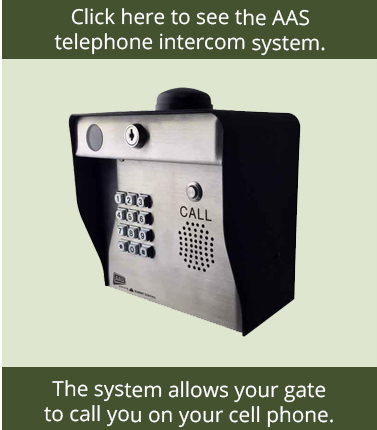 The Sentry 300 Series Gate Swing Swing Gate Opener by U.S. Automatic is proudly manufactured in the U.S.
Welding is the recommended method of securing the linear actuator mounts to the gate and hinge post. Bolt on brackets are provided and are acceptable but may require frequent service to keep tight. They must be very securely attached (i.e. carriage bolts with lock nuts and washers). Lag type bolts are not recommended. Loose or unstable linear actuator mounts will result in improper operation.